Based out of Melbourne, Australia, the client is a well-known engineering consulting and design services company operating for a decade and a half with multiple locations across the continent. The client serves a broad range of industries, including Mining, Manufacturing, Agriculture, Rolling Stock, Defense, and Engineering, as well as Government and Councils, etc. As one of most preferred services company in Australia, the client has a strong customer base and has a number of top consulting projects in its kitty. With a focus on Manufacturing and Mining Engineering services, the client has provided mechanical designs for some of the world's largest enterprises. The client required support in providing consultation on a complex stairwell design for a school project. They needed help to design the stairwell from scanned drawings and wanted the new design to carry the minutest details to be reflected in Autodesk Inventor software. They required 148 drawings to be completed within 10 working days, which was a challenge and required a scale up in the team. The other issue being lack of clarity in the PDF images and which needed clarification from the client. With our two-decade-long history in complex AutoCAD conversion assignments, Outsource2india was able to understand the requirement well. We employed a team of six drafters, one quality expert and an account manager to look over this project. To solve the issues with the lack of clarity in the PDF files, we followed European Matric ISO standards for Fire exit and completed the project successfully. We followed a proper communication strategy to keep the client in the loop during the project execution. We received the scanned PDFs through Dropbox and completed 10 sample files to obtain approval from the client. We created the entire project in AutoCAD and provided a 3D view in PDF to help the client visualize the stairwell properly. Outsource2india is a leading conversion services provider offering world-class engineering services to global clients. As an efficient and established service partner in the industry for over two decades, we offer a variety of mechanical engineering services which include mechanical drafting, piping design and drafting, AutoCAD conversion, 3D modeling and rendering, etc. We provide quick, efficient, and cost-effective mechanical engineering solutions to all our clients and ensure that their business needs are precisely met. Outsource2india has been a leading provider of AutoCAD drafting services and a plethora of other mechanical engineering services to clients across the globe. 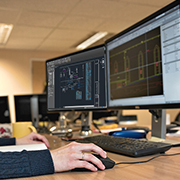 Having been in the industry for over 20 years now, we have gained enough experience in handling any kind of AutoCAD drafting service requirements. We make use of the latest tools and technologies which ensure that we deliver the best-quality services within a quick turnaround time. Contact us today, for any AutoCAD modeling or drafting requirements to avail best-in-industry service.